Catamaran Cruise Dubai about how to purchase air tickets online. 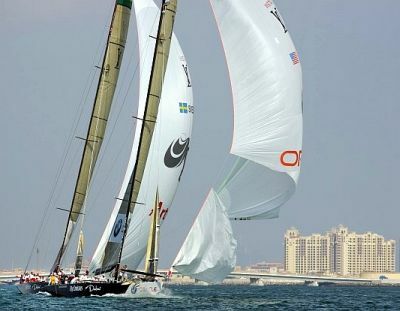 Dubai catamaran cruise tour, sail in the Arabian waters aboard the Catamaran. 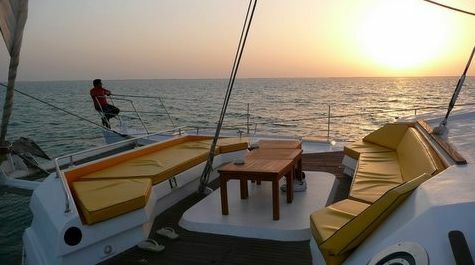 Scheduled Tour: �4 HOUR CATAMARAN DUBAI� Enjoy an unforgetable evening on the 82 feet Catamaran sail cruise. Every Monday 13:00 to 17:00. Operating: Saturdays from 14.00 until 18.00 hrs. The tour includes water, 2 soft drinks and snacks. For your information, this 24 meter catamaran is also perfect to host a corporate event (incentive, training, product launch, etc.) or a private event (wedding, birthday and anniversary) and is available for rent on an hourly basis. In the week day is less of 500 aed per hour. Depart Point: Dubai Creek, in front of the �Ruler�s Court�. Located in the creek in Bur Dubai historical quarter "On verra 6": our 82 foot aluminium sailing catamaran is designed and built by its owner, Mr Claude Kermoal, renowned French ship builder in his country and West Indies. Up-to 82 guests in safety and comfort. Cruises last from 3 to 5 hours. 280m2 including: an air conditionned lounge, two sundecks, a shady cockpit, bedrooms with en-suite. Boat equipped with a professional kitchen and catering equipment. A bar where our bartender serves cocktails and refreshments. "On verra 6", the Captain and crew will customize a perfect cruise to suit your needs. Do you want to reward your team or your customers? Are you looking for that perfect event to build cohesion or enhance communication? "On verra 6" promises to be the ideal venue! What about have fun in style on a catamaran? Come on-board and enjoy the playground! Why not enhance your sightseeing experience in Dubai�s historical sites, by taking a voyage on the azure waters of the Persian Gulf? Don�t hesitate, book your Dubai coast-line cruise with us for a truly memorable and relaxing sight-seeing trip! Each cruise promises you a fun filled adventure! This 24 meter (82 ft) maxi-catamaran that features a wide air conditioned room and has a capacity for up to 80 people is ideal to get the best sight of Dubai from its shore and at the same time to spend a good time between friends and family. 1. Navigate the Creek, Dubai�s spinal column. 2. Have a look at �The World� islands and the Palm Deira, two of the most incredible projects under construction worldwide. 3. 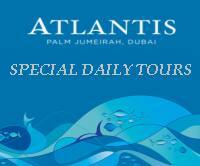 Admire the wonderful and unique Palm Jumeirah as well as its jewel, the incredible Atlantis. 4. See the other side of the only 7 stars hotel, the Burj al Arab. 5. Enjoy the amazing shapes from the sea of the Sheik Zayed Road skyscrapers, in particular the recently inaugurated Burj Khalifa, the highest tower in the World. 6. Swim in the beautiful and delicious waters of the Persian Gulf. Meanwhile, on the boat, our guests will just live a Dubai Only Experience, based on the World famous Arabian Hospitality! You can be sure that they will never forget their moment on this tour, as they will never forget their journey in Dubai. Why does a travel agency need to offer our tour? You can send from 1 to 80 customers, you can be sure they will receive the best attention. You don�t have to worry about anything: just make a reservation and let them enjoy the tour! You offer your customers an unforgettable moment in Dubai, probably one of the highlights of their journey here! You add an incredible activity to your menu of services without investing anything. You can also take in charge the transportation to the departure point: another opportunity to increase your margins. Sea Horse Passenger Yachts & Boats Rental LLC is a company imagined by two dynamic European professionals dedicated to nautical activities since 1985, especially in the Caribbean Sea and the Gulf of Mexico.